To make the dough, sieve together the flour and salt into a large mixing bowl. Make a well in the middle. Lightly whisk the egg with the soured cream and 2 tablespoons water and pour into the well. Using a fork, start working the flour into the wet ingredients, until you have a rough, floury dough. Turn the dough out on to a a lightly floured work surface and knead until the dough is smooth. It should not be sticky – if it is, add a little more flour. Cover the dough with clingfilm and leave for 1 hour. Meanwhile, make the filling. Cover the dried mushrooms with hot water and leave to soak for 10 minutes. Melt half of the butter in a large frying pan and add half of the onion, field mushrooms and garlic. Fry for a few minutes until the mixture is quite dry. Rinse the sauerkraut in cold water and wring out thoroughly. Finely chop and add to the frying pan. Drain the dried mushrooms, reserving their soaking liquid. Finely chop and add to the frying pan. Strain the reserved liquid into the frying pan. Add 200ml/7fl oz water. Leave to cook on a low heat, stirring regularly, until the whole mixture is quite dry and the sauerkraut has softened, this should take about 20 minutes. Stir in the parsley and dill and et aside. Leave to cool. Roll the dough out to a thickness of 1-2mm. Use a cutter to cut out rounds of 7cm/2¾in diameter. Bring the offcuts of the dough together to make the remaining circles. Put a tablespoonful of the cooled mushroom and sauerkraut mixture in the centre of each round. Then bring the edges together to form a crescent shape. Crimp or pleat together with your fingers or use a fork to seal. To cook, bring a large pot of salted water to the boil. Cook the pierogi, in batches, for about 5 minutes. They are ready when they float to the top. Drain and put on kitchen paper. For the topping, heat the remaining butter in a large frying pan and cook the remaining onion until soft, add the breadcrumbs and mix. Fry until the breadcrumbs are crisp. 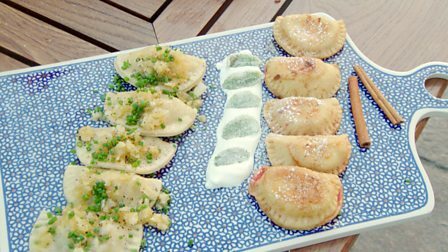 Top the pierogi with the onion breadcrumbs and chopped chives and serve.